This painting needed to speak about power and ambition. For Sariel, the phases of the moon represent the rising and falling nature of our lives. I knew that I wanted to do a piece with the moon being full and Sariel looking fully empowered but I’m never happy unless the themes get more specific than that. As the Earth tugs on the Moon, the Moon tugs back on the Earth. For each force, another will always exist in perfect opposition. The lives of men and Angels are similar. Though the power of one may be greater than the other, their existence reflects each other. When the war started, the Angels that were uninvolved stayed clear of the wave of death that spread across the Earth. To risk one’s immortality on fighting seemed chance not worth taking. Sariel perched above it all, waiting for the wave of bloodshed to roll back. In doing so, his power receded as well. He waited patiently and watched himself waste away. He waited for his time to come, to venture out and regain his freedom amongst the stars. As always, I huge shout out to Patreon members! 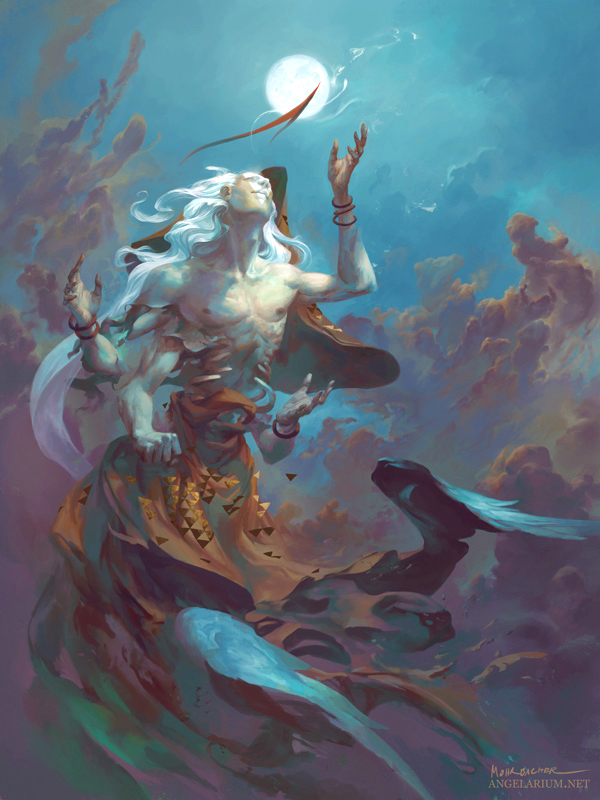 As a sustaining member, Angelarium, the Encyclopedia of Angels is being built for you.